Bonhams is pleased to announce the December 15, 2010 sale of Fine Jewelry in New York. Simulcast between New York, Los Angeles, and San Francisco, the 167 lot auction will feature a vast array of diamonds, art deco baubles and modern jewelry; including offerings from important designers such as: Andrew Grima, Bulgari, David Webb, Mauboussin, Tiffany & Co., and Valentin Magro. Virginia Salem, Director, Jewelry, said, "Building on the renewed strength of the international and national jewelry market, we are pleased to present fresh offerings of all periods that have been procured from widespread estates, private individuals and collections through out the US. 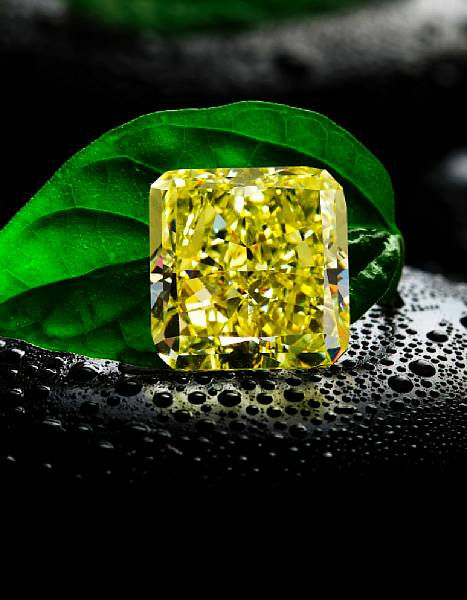 Highlighting the list is a rare 25.56 carat natural fancy yellow diamond from a Midwestern collector." The highlighting sale, an impressive fancy colored diamond pendant necklace, is a cut-cornered square modified brilliant-cut diamond, weighing 25.56 carats within a bezel-set mount and suspended from a fancy-link white gold necklace; stating natural fancy yellow even color with VS1 clarity (est. $350,000-450,000). Accompanied by GIA report #1122747658, dated October 28, 2010, stating natural fancy yellow even color, VS1 clarity. Additional diamond rings of interest include: the diamond three-stone ring, a rectangular-cut diamond, weighing 7.01 carats, flanked by rectangular-cut diamonds each weighing 1.21 carats, completed by round brilliant-cut diamond five stone-shoulders (est. 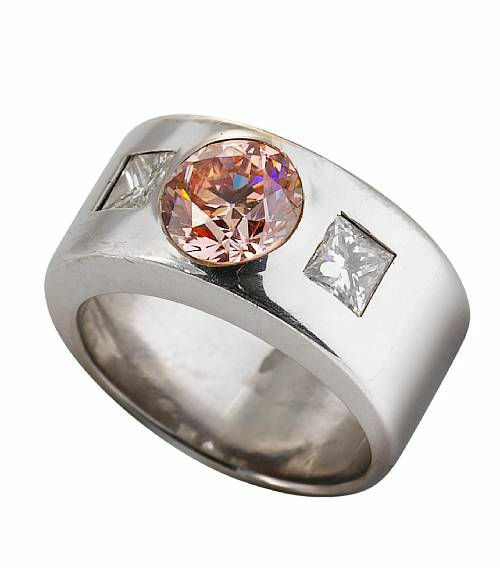 $170,000-190,000); the colored diamond and diamond ring, an old European-cut fancy orangey-pink diamond, weighing 1.23 carats; within a broad mounting accentuated by two modified square-cut diamonds (est. 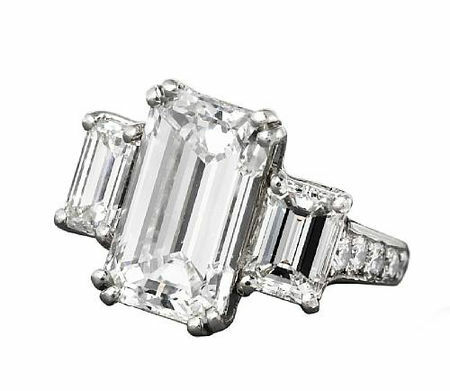 $50,000-70,000); and a diamond solitaire ring, a square modified brilliant-cut diamond, weighing 5.15 carats, with tapered baguette-cut diamond shoulders and a plain mount; F color, VS2 clarity (est. $80,000-100,000). Accompanied by GIA report #12776079, dated August 11, 2003, stating the 7.01 carat diamond as: G color, VS1 clarity. 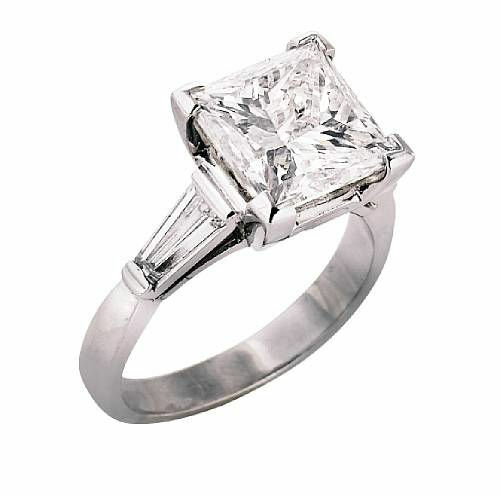 Accompanied by GIA report #12763469, dated August 14, 2003, stating the 1.21 carat diamond as: G color, VVS1 clarity. Accompanied by GIA report #13091974, dated February 28, 2004, stating the 1.21 carat diamond as: H color, VVS1 clarity. Accompanied by GIA report #5121668306, dated October 15, 2010, stating the old European-cut diamond as: natural fancy orangy-pink even color. Accompanied by GIA report #2125747649, dated October 29, 2010, stating: F color, VS2 clarity. 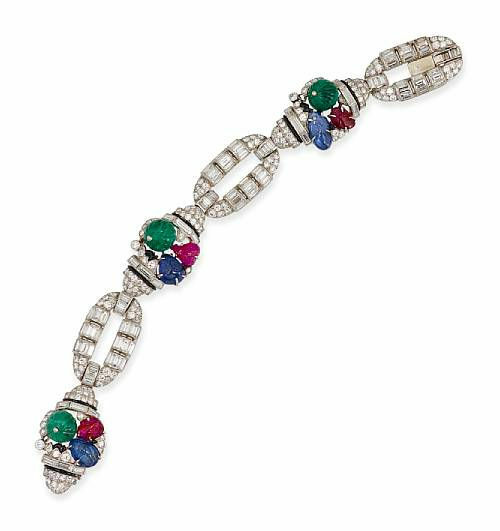 The sale features an important "Tutti-Frutti" bracelet by famous Parisian joaillerie, Mauboussin, who's signature style of the late 1920's were colorful and textured pieces, melded with cultural inspiration and artistic prowess. The bracelet, a diamond, gem-set and enameled wrist adornment, circa 1930, encapsulates this period in history; total estimated weight 13.90 carats (est. $15,000-20,000). of the signature style of Mauboussin. 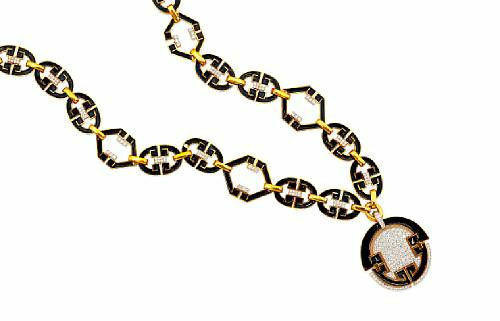 Several offerings of note include pieces from the modern jewelry designer, Andrew Grima, whose cutting-edge designs attracted clients such as Jacqueline Onassis, Ursula Andress, Princess Margaret and the Queen. The collection showcases: an opal and diamond ring, a square shaped opal within a scalloped surround of pave'-set round brilliant-cut of 4 carat diamonds and a tapered gold mount (est. $2,500-3,500); a citrine, emerald, diamond and eighteen karat gold bracelet, of tapered and openwork design with five oval-shaped citrines, and accentuated intermittently with round brilliant-cut diamonds and circular-cut emeralds (est. $6,000-8,000); and a green beryl and diamond pendant designed as a bezel-set cushion-shaped cabochon green beryl with a geometric surmount of round brilliant-cut diamonds, suspended from an associated eighteen karat gold torque necklace, weighing approximately 35.00 carats (est. $4,000-6,000). Further eye-catching jewels for auction are: a diamond, ruby and eighteen karat gold bangle bracelet by Valentin Magro, total diamond weight 27.50 carats (est. 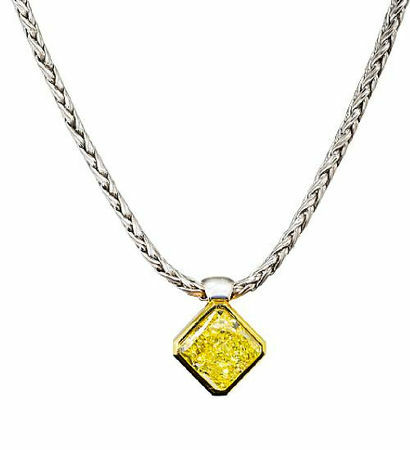 $12,000-15,000); a diamond, enamel and eighteen karat gold sautoir and pendant by David Webb; total diamond weight 17.00 carats (est. 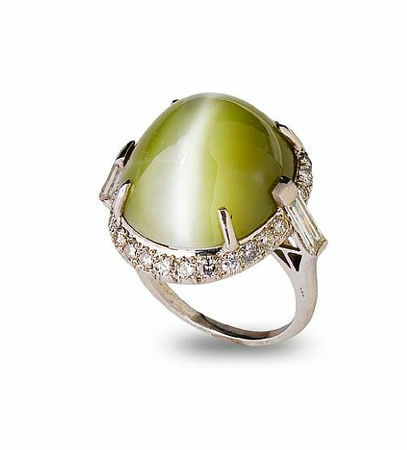 $20,000-30,000); a cat's eye chrysoberyl and diamond ring, chrysoberyl weighing approximately 35.00 carats; estimated total diamond weight 1.30 carats (est. 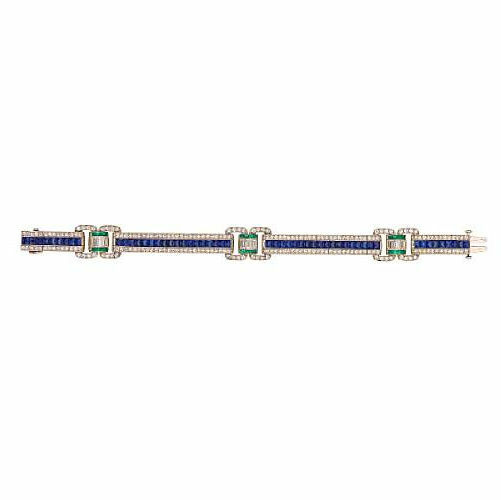 $5,000-7,000); and a diamond, sapphire and emerald bracelet, by Oscar Heyman & Brothers; estimated total diamond weight 4.50 carats (est. $5,000-7,000). Valentin Magro, artist and designer, is renowned for creating distinctive jewels for his private patrons. His creations, while each unique, share his signature elements; the harmonious relationship of color, nature, and balance, typically whimsical and bold, they intentionally reflect the personality and lifestyle of the wearer. Born on Malta, Magro immigrated to the United States at eighteen, to study architectural and structural engineering. 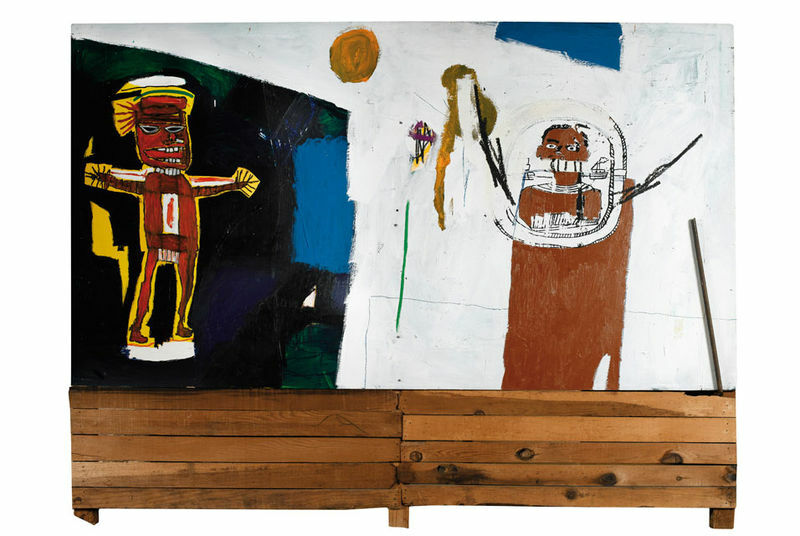 Innately interested in spatial relationships, and skilled draftsman, he was afflicted with wanderlust, which caused him to change his direction and become what he is today, a designer, master jeweler, and an artist. Eventually settling in New York, and working for the venerable houses of Tiffany & Company, David Webb and Harry Winston, he honed his craft manufacturing high-end jewelry to an art. Today, he designs and manufactures his own creations. 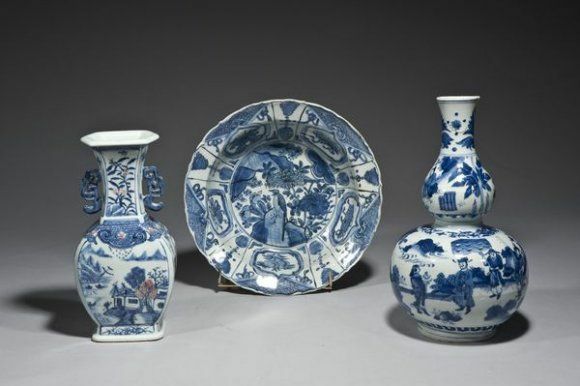 Typically working hand in hand with a patron he starts by offering several design ideas, making seven or eight drawings displaying various adaptations of a theme. Then they narrow down the selection to three drawings. From there, the stones and metals are chosen; undoubtedly color, saturation, liveliness, shape and size are of utmost importance. Once these details are finalized, a model is created and examined for perfection. Balance and harmony are vital to all Magro's creations, as is the meticulous setting, polishing and intricate bench work utilized in the final work. The three designs on this page all display the predisposition towards a whimsical nature theme, each created for client and friend, Joy Bogen, the famous Metropolitan Opera soprano. 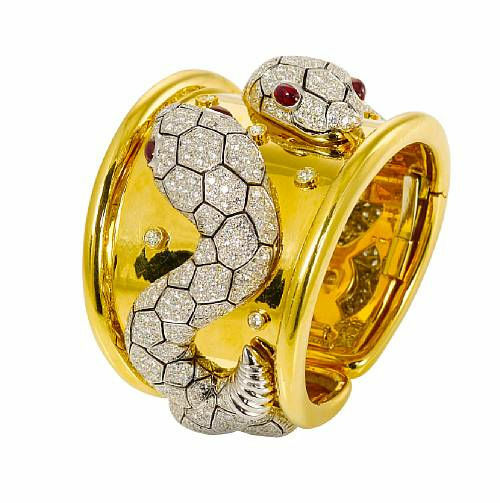 Magro was successful in capturing her fondness for snakes in this large voluptuous bangle. For this commission, it took several months to create the perfect balance of black and white space of the snake's skin, as well as an elaborately engineered hinged band. The adorable and life sized mahogany frog brooch needed additional brilliance to reflect the lifestyle of Ms. Bogen, so Magro speckled the reptile body with numerous diamonds emulating water droplets. To the opal fish brooch, Bogen was attracted to Magro's amusing paveset starfish and golden pearl nestled amidst lush reef life. These remarkable creations, which are so inimically and unmistakably Magro, are beautifully and thoughtfully crafted. They are bold, individual and fanciful jewels which exemplify the genius of an artist.